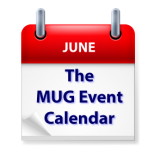 While all eyes will be on San Jose and Apple’s WWDC this week, there are plenty of other great events on The MUG Event Calendar for those staying at home. Apple’s Dave Marra will visit a New York group, and Bob “Dr. Mac” LeVitus will present to a Colorado group. An HP rep will talk ink at a Florida group, and Slack will be discussed at a Nevada group. Picnics, digital spring cleaning, and backups are among the other topics to be covered this week.